The Business Of The Brain On The Internet: How To Take Advantage Of The Psychological Power Of FREE! Would the offer of a FREE! tattoo make you more inclined to go under the needle? Well, if you have been toying with the idea of getting a tattoo; the offer is coming from a well-respected and clean provider; and you're just the slightest bit drunk, then quite possibly, yes. (Kind of gives new meaning to the idea of locating customers' pain points, huh?) That's the power of FREE! I'm going to go out on a limb here and say that you probably aren't offering free tattoos on your website. But that doesn't mean the psychological power of free works fundamentally differently for your products and services. What is it about FREE! that's so irresistible? "Get a free session with a personal trainer when you sign up for a gym membership." "Free body butter with $80 massage purchase." "BOGO shoe sale for back to school." According to behavioral economist Dan Ariely, deep-rooted psychological principles explain why marketers and entrepreneurs are smart to use the allure of free offers to attract more shoppers. Bottom line: FREE! works. While most transactions have an upside and a downside, when something is free, we forget about the downside. FREE! gives us an emotional charge and we transfer that feeling to the item being offered making it seem more valuable than it really is. The power of free is also tied to our primitive fear of loss. Because there's no visible loss, the free offer makes us feel safe. In Predictably Irrational, Ariely focuses on how the emotional pull of getting something for nothing, which he calls the zero price effect, can lead us to make bad (i.e., irrational) decisions. For business owners, the relevant concern is about how to keep your value, while offering something for free. 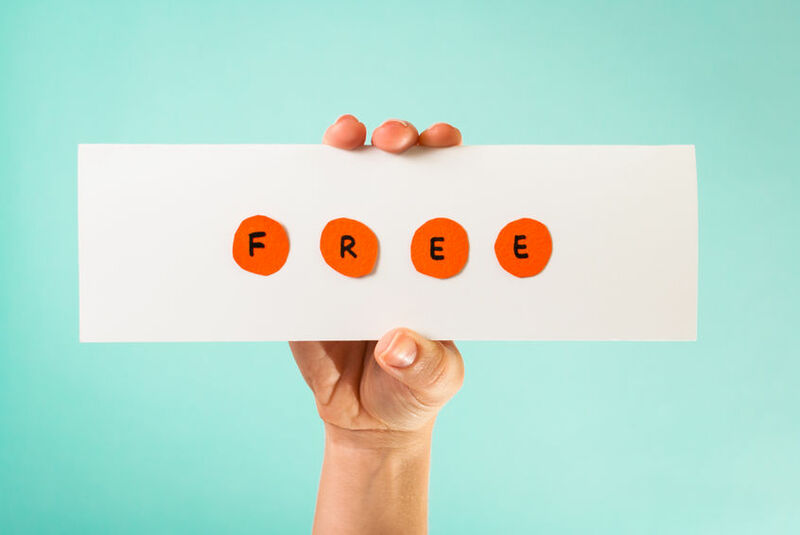 When thinking about how to harness the power of free for your own products and services, it's important to keep in mind that a free offer is a marketing tool. As with all marketing tools, the key to making giveaways successful is to carefully consider your goals ahead of time. So think about what you want to accomplish: Are you hoping to attract new sales leads? Do you want to build a social media following? Is your goal to entice past customers to return for an upgraded product or service? Are you looking to introduce a product with new features that might nudge formerly reluctant customers past their tipping points? Once you know your goals, you can strategically choose the right type of free offer to drive traffic from your target audience and influence them to purchase something. Most people buy things that they have a personal connection with. This is because a personal connection is an indication of value. The best way to connect with your ideal client is to consider what problems they might have and how you can solve them. For example, back before the days of Amazon Prime, many of Amazon's ideal customers were hesitant to purchase books online because they didn't want to pay extra for shipping. Amazon recognized the problem and included a free shipping offer for orders over $30. Someone purchasing a book for $16.95 might pay an additional $3.95 for shipping, for instance. But if the consumer bought another book, for a total of $31.90, then their shipping would be FREE! Some probably didn't really want the second book, but FREE! shipping was just too tempting to pass up. Sales went up like crazy. One big goal of a free offer is to give people a taste of how fabulous your business is, so they walk away thinking "I need to work with this company." At Spring Insight, we focus on website and online marketing strategy. Our main offering is a 20-minute FREE! website assessment, which users can sign-up for online. During the session, I get on the phone with you while I review your website and tell you what specific changes to design and functionality would help you run your business more effectively. But beyond giving advice about structural changes, I talk strategy. Sure, you could take my ideas straight to your web developer, but chances are you will be so impressed with my expertise, that you will see way more that's valuable than simply website reorganization tricks. Never forget that your customers are smart. Then treat them that way. We have all found ourselves inadvertently in the middle of a hard-selling sales pitch at one time or another. The reason such sales pitches are so annoying is that they make us feel like someone is trying to trick us into buying something we don't need or can't afford. The most notorious example of this is the FREE! vacation in exchange for listening to a presentation from a recent college grad with a business degree trying to convince you to buy a time-share. How does that ever work? But doesn't FREE! devalue my product or service? Nope. Not in my experience. The key here is to focus on giving away ideas, not products. How do you earn permission to speak to a group of people who will engage with your message, buy what you sell, and share your ideas? You build a reputation for being a generous, creative person who loves to share her brilliance with the world. My free website assessments raise my visibility. This is also a big reason I write blog posts like this one and why you should be blogging regularly too (Our marketing team would be happy to help you get started, just saying). It's a great way to get in front of people who are otherwise ignoring you. Sure, you will get some freeloaders and cheapskates. But if you are strategic, your free offer will also be a siren sound for your ideal clients--the ones who will become not just one-time buyers, but loyal customers who return because their first impression of you was all about generosity. I don't worry about giving away my value because I've got plenty more great ideas to share once that proposal is accepted. While your customers probably aren't in the market for that FREE! tattoo, if you can tap into the free offers that will get them flocking to your website and telling all their friends about your company, you will see positive results. Can Spring Insight help you develop a strategy that will have you experiencing the power of free firsthand? Looking for more great website and marketing tips? Follow Spring Insight on Twitter, Facebook, or Google+.